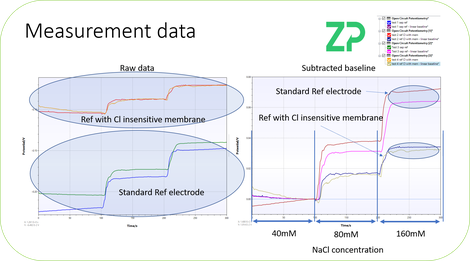 2) LONGER TERM STABILITY - In the adjacent image ZP has run two of its chloride resilient sodium sensors in 40 mM sodium solution for 64 hours. Both sensors kept within a 40 mV wide band. This would mean that the sensor was showing a change that was equivalent to going from 40mM to approximately 160 mM. Both sensors were on the same solution but were in fact run on separate instruments. This would make one think that something extrinsic to the sensor and the solutions was causing the solutions/sensior to change its apparent sodium concentration; an obvious parameter would be temperature. One would conclude that if we repeated the experiment but with temperature control then the apparent stability would be improved.